How would it feel to not have to put in your pin number when you are at checkout, but instead have to use a finger print scanner? This idea was not brought up in the United States it was actually brought up in the Africa where they made it and thought it would be a good idea to have a biometric finger print scanner to pay for things. Freshmen student at Husson University Alex Charette gave his thoughts on it, “ I like typing in numbers, but with it being scanned it make sit more safe so people cannot take your card and money, it helps so people can’t pretend to be you and use your money”. 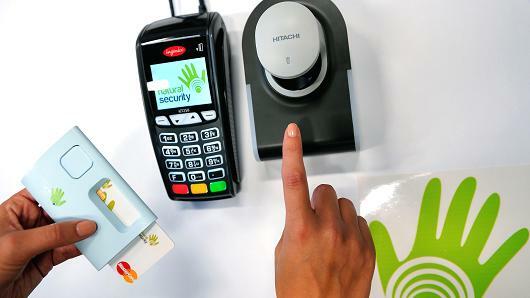 Now the technology works in similar ways of a mobile phone would be to pay, It would make it so you have to put your finger over a sensor as you pay. Which would make it so you don’t have to type in your 4-digital pin number. The payment card is designed for a small biometric are designed to verify the person’s finger print. The finger print will end up being imbedded right into the bottom of the phone. The card is being called the “next-generation biometric card”. Sophomore student Bryce Carter here at Husson had this to say about the finger scanner credit card, “It’s great that they are moving in that direction. It will definitely make it more convenient”. Master card which has over 65,000 transactions every minute of the day worldwide, made the announcement after two successful test were done in South Africa. It might not be done for alittle while still as they are still extending a trial process to make sure it is affective as it sounds. If it ends up being as successful as it seems they will start to distribute the technology throughout the Africa and Asia later this year. With finger print scanning dos come issues as a Berlin-based analyst Security Research Lab had been hacking scanners which one of them has been the Samsung Galaxy S5. As we know Samsung has been struggling lately with one of their phone’s exploding. Bryce also commented on how comfortable he would be about the hacking part, “ It seems like everything gets hacked these days, like the Icloud. They just have to risk it”. The inventory of this was Master Card itself. The process on how to do it is you must enroll the Master Card by registering for their financial aid. After that the finger print is transformed into a encrypted digital template which in the end is stored on the card. After that the card holder can use the card at any EMV( Europay, Master card and visa) card critically worldwide. This is the next part of the world relying on technology and next till advanced technology to make this world a better place.